My name is Jenny Edelman and I am a Real Estate professional with Century 21 Strand Group specializing in oceanfront property. A native to the area, I have witnessed the growth and many changes Myrtle Beach has undergone over the years. I am an honors graduate from the University of South Carolina and realized upon receipt of my degree that beach Real Estate was my destiny and obtained my Realtor designation in 2005. I have an incredible pulse of the Myrtle Beach market that I attribute to my native-knowledge as well as having a family background in Resort development! My mission is to service each of my clients in an efficient, ethical, and energetic manner. My greatest strength is my passion to help people and I would be honored to help guide you as my client and assist you in fulfilling your Real Estate wants and needs in the Myrtle Beach area. Jenny was a godsend. We was very knowledgeable about the area and provided great guidance throughout the process. She was helpful and flexible, with great follow up and detail orientation. We have already recommended her to friends who are looking for property in the area. Jenny Edelman was very knowledgeable and professional handling all our needs during the process of finding a condo. She always responded to emails and phone calls with suggestions or helpful information. We would recommend Jenny to others for their real estate needs. My 4th oceanfront condo purchase in 6 years, all with Jenny. I have recommended her in the past and definitely would again. Thanks for the help buying up great Myrtle Beach properties! There is nobody more knowledgeable in the condo area. I appreciative all the time Jenny invested in our home search. Jenny is a very knowledgeable, professional and friendly realtor who went out of her way to answer my many questions. She took the time to determine exactly what we were looking for and walked us through the entire process. I would recommend Jenny to my family and friends. Jenny's knowledge of the oceanfront condo market proved to be invaluable in establishing a realistic sales price for our unit. She moved quickly to include the property in various real estate internet sites and the print media. This resulted in wide exposure of our property to hundreds of thousands of potential buyers. We could't be more pleased with her expertise and professionalism. Jenny Edelman has been there for every step. I am very satisfied, she was very professional and kept me up to date throughout the process. Jenny Edelman is a very hard worker and century 21 should be proud to have her as part of their team! Thank you all again!! Jenny Edelman was very thorough in our listing and helped to maneuver through a few offers we received. She is an excellent communicator and obviously wants to make sure her clients needs are met. We happened to run across Jenny Edleman purely out of property curiosity in 2014. She was very pleasant and paid close attention to our needs. We purchased a home in Nov. 2014, since that purchase we have recently sold that property which Jenny listed and sold quickly and also bought another one with her expert services. We value her opinion and her knowledge of the areas and couldn't imagine buying anything with anyone else. She is very thorough and the most helpful realtor ever! You have a "Jewel" in Jenny. We really appreciate her. Jenny was great to work with... She was right on top of any question or issue that i have. She worked hard to meet the timeline on closing and we got to close in less than 2 weeks. I highly recommend her to anyone looking to purchase a unit. We met Jenny a few years ago, we bought a house with her expert help. She was very professional, knew everything about the area. If she didn't know the answer to a question we asked she promptly found out. We just currently bought a new home also with Jenny's expert help. We also have our house we bought 2 years ago listed with her for sale. We couldn't imagine buying a house with another realtor. She is kind and understands our needs and desires. She does not disappoint with her broad knowledge of the areas and laws. We appreciate Jenny. Jenny Edelman is very knowledgeable of the market and is upfront and truthful. She answers questions directly and if she does not know the answer she will find it and has great follow-up skills. If you are looking to buy or sell a property in the Mrytle Beach area I would recommend her highly. I originally emailed Jenny from one of her listings. Being 'snowbirds' it took us some time to work out a date that we would fly down & have a few oceanfront condos that appealed to us. Jenny was ALWAYS available, whether it be through email/text/phone call which to me is very important. ALWAYS pleasant, understanding &amp; concentrating on properties that appealed to us, not trying to steer us in a different direction (which we have had from other realtors). We did purchase a condo to presently use as a rental/occasional personal use property which eventually will be our winter getaway. If this property works out as we hope (make a little supplemental income), Jenny will be the first realtor I will contact if we decide to purchase another property!! Cheers, thank you Jenny! Rick What can I say....excellent in every way! Jenny was recommended to us by an employee of the Camelot by the Sea Resort. After meeting her, we felt she would perform her duties with our best interests at heart. Jenny was a pleasure to work with and found answers to our interests and concerns in a very timely manner. Jenny was very professional - a real pro. Jenny Edleman is top notch! She is professional, knowledgeable, in constant contact. She assisted us in our house sell which sold in 2 days and promply helped us find and purchase a new home. Pheunominal agent! Jenny is FANTASTIC at her job.Over the Top.will Recommend her to everyone.Always available, returns phone calls quickly, answers questions or gets the answers.She gets the job Done.You will miss out if you dont use Jenny!!! Jenny is an outstanding person. She is very knowledgeable and helpful in every aspect of Real Estate. Very understanding and gets the job done. I was very impressed that my property was sold within 32 days of her listing it. The marketing and photos were phenomenal. I would definitely recommend Jenny to anyone that is looking to sell or buy property. I appreciate Jenny's hard work and dedication to me as her client. It was a pleasure working with her. Great job!!! Jenny does it again!! This is my second condo I sold with her and she got top dollar again! She is professional and a solid negotiator. I wouldn't hesitate to use her again. Jenny is a good listener and right away understood our needs, especially being non residents. She had answers to all our questions and worries and never was impatient or unprepared to answer. Jenny is very professional in every way and we never had to wait for a reply, no matter how confusing our questions or how long the process. We would not hesitate to recommend her and only wish she were here to help us with our real estate needs in our country. Upon entering a condo we rented for several days, I observed upgrades & the upper level view & had a hunch it was on the market. Googled Beach Colony Resort listings. 1st real estate site had misidentified it as a 2nd (not 20th) floor unit. Went to next site (Grand Strand Century 21) & found the listing. After completing an interest form online, Jenny Edelman contacted me immediately. She helped us make our offer, negotiate a price & close the sale 3 weeks later. Couldn't have done this without Jenny's outstanding help. I consider myself so lucky to have stumbled onto Jenny Edelman. As Jenny is a native of Myrtle Beach & a beachfront condo specialist, I had the utmost confidence & trust in her. She promptly provided answers to every question I had. I felt she always put my best interests first & provided knowledgeable guidance throughout the purchase process. Couldn't have been easier. 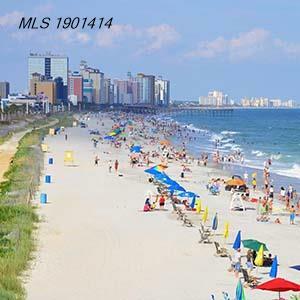 I would recommend Jenny Edelman to anyone looking to buy or sell beachfront property in the greater Myrtle Beach area. She could not have been more attentive to my needs, even when complicated by having to serve them long distance once I returned home. She arranged the necessary legal services, electronic document signing, accepted a photo of my deposit check pending mail receipt & we finally met at closing. Jenny Edelman truly is your Broker by the Sea! Jenny was so helpful in all aspects. Due to the fact that I was 5 hours away she went all out to help me in any way she could. I really appreciated her dedication, work ethic and personal attention. Jenny Edelman, as before, was very professional in catering to our needs. Jenny holds high degree of integrity and credibility. She was unbiased about the pros and cons of each of the properties shown to us. She has earned our trust. We will look forward to doing business with her again! Jenny Edelman was very patient with us and helped us navigate the condo association rules pertaining to pets. We would highly recommend Jenny as a realtor. The question about the performance of the other agency people: Cannot speak as to how they performed; Jenny was the front for us. I am sure others supported her, but we did not see any of it. That is why were really appreciated Jenny. Jenny Edelman is one of the most ethical and competent real estate brokers I have ever dealt with. She handled the sale of our Myrtle Beach condo in the most professional and effective manner. I would gladly recommend her to others. Thank you Jenny! Jenny has been great! Her knowledge of the Myrtle Beach area is outstanding!! Jenny is a great personality with excellent communication skills. Her knowledge of local property market is remarkable, outstanding. She'll guide you with the best deal and easy all paperwork step by step. I'd highly recommend Jenny without any hesitation & looking forward for a new deal. Jenny is very knowledgeable, professional and detail. Thank you very much and will work with you again in the future.